University graduate: Nutrition. UFPel, 2000. Master: Medical Sciences (Endocrinology). UFRGS, 2005. "Dietary methods to estimated protein and lipid intake in patients with type 2 diabetes: food questionnaires and biological markers"
PhD in Nutrition. UFRJ, 2012. 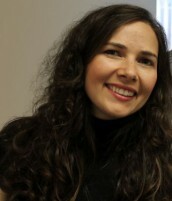 "Serum fatty acids, dietary patterns and mental health during pregnancy"
Luna Strieder Vieira. Socioeconomic trajectory and nutritional status:1993 Birth Cohort, Pelotas, RS. (Epidemiology) - Federal University of Pelotas (Co-adviser). Isabel Bierhals. Title to be decided. Start: 2015. (Epidemiology) - Federal University of Pelotas (Co-advisor). Ediana Volz Neitzke Karnopp. Ultraprocessed foods and its effects on nutritional status and lipid profile at 18 years. (Nutrition) - Federal University of Pelotas (Co-advisor).